Breaks in the deposition of crown enamel reveal how fast teeth grow. Neanderthals formed their crowns 15% quicker than we do, reaching adulthood when modern humans of the same age were still floundering in adolescence. "When you have a high mortality, you have two evolutionary solutions. 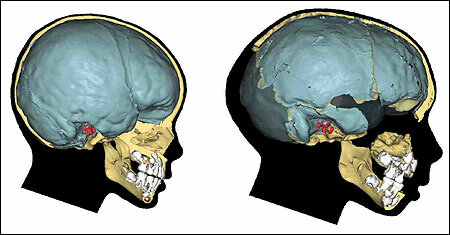 One is to have a short growth period, the other is to have many offspring at once"
A modern human child (left) compared with the Gibraltar 2 Neanderthal child (right) from Devil's Tower, Gibraltar. Image: Christoph Zollikofer, Marcia Ponce de Leon. Perikymata are disturbances in the deposition of crown enamel which are preserved on the tooth's surface as a series of horizontal ridges. More closely spaced perikymata indicate a slower rate of growth, while more widely spaced perikymata point to faster growth. 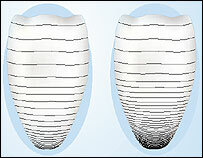 In modern humans (Homo sapiens), tooth growth slows dramatically after the formation of the top half of the crown. This leads to more closely spaced perikymata in the bottom half of the crown. In the Nature report, Fernando Ramirez Rozzi and Jose Bermudez de Castro analysed incisors and canines from 119 individual human remains from Europe spanning a time period of about 800,000 years. They found that perikymata were generally more widely spaced in primitive humans such as Neanderthals, Homo heidelbergensis and Homo antecessor than in our own species. But Neanderthals had the most widely spaced perikymata of all. The authors argue that this indicates Neanderthals grew more rapidly overall. This rapid rate of growth could have been an evolutionary outcome of high adult mortality in Neanderthal populations, they claim. "When you have a high mortality, you have two evolutionary solutions. One is to have a short growth period, the other is to have many offspring at once," Dr Ramirez Rozzi, of the Centre National de la Recherche Scientifique in Paris, France, told BBC News Online. "But in humans it is not a viable option to have more than two or three offspring at once. So I would suggest that the high mortality in Neanderthals was the selective pressure responsible for their rapid growth." Professor Christopher Dean of University College London told BBC News Online: "I sense that the authors are right. But they haven't looked at any internal histology on the teeth and they haven't looked at molars. "I think in future, the priority needs to be to look at the molars because they're really crucial in establishing life history." 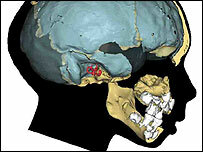 Some researchers have linked slower development to increased brain size over the course of human evolution. But the Neanderthals seem to follow a reverse evolutionary trend, with fast growth and a big brain. The results might suggest this trend could be completely random, said Dr Ramirez Rozzi. Dr Christoph Zollikofer, an anthropologist at the University of Zurich, Switzerland, said the work agreed very well with examinations of Neanderthal and modern human skulls he has carried out with his co-collaborator Marcia Ponce de Leon. "Neanderthals had probably the same pace of brain development as modern humans," he told BBC News Online. "But as soon as this was approximately finished, by the age of three or four, Neanderthals were still on a very fast time course to reach adulthood. "Modern humans gained time in terms of their cognitive development. If you develop more slowly you can learn more." The results bolster the theory that Neanderthals were committed carnivores. They must have had a very high-calorie diet to fuel their rapid growth and sustain such a large brain.